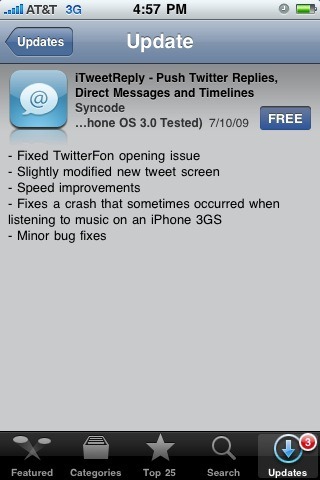 iTweetReply, the push notifications-enabled Twitter app from Syncode, received a minor update today, bringing it to version 1.1.1. 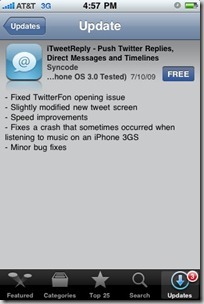 This update fixes some minor bugs including the TwitterFon opening issue, modifies the new tweet screen slightly, and includes speed improvements. Though not incredibly pressing, if you ‘re an iTweetReply user, you ‘ll want to make sure you update the next time you ‘re syncing with iTunes. The update is propagating its way through the App Store now, so it should show up for you anytime here. I couldn't for the life of me (install.. uninstall… re-install..) get this app to push replies to me at all… I just gave up in the end… uninstalled… pffft.